As the holidays begin, another conference season comes to a close. For the past week, Sara and I have been in Philadelphia at the National Writing Project‘s “Digital Is…” pre-conference, the NWP Annual Meeting, and the National Council of Teachers of English Annual Convention. As it is each year, we enjoy spending time with colleagues and find opportunities to learn about their work. Moreover, we pause to think about our own work including what we have accomplished in the past year and what we are looking forward to in the next. To that end, I began writing this reflection in the lobby of the Sheraton in Philly, continued it at the airport and on the plane, and now post it as I spend Thanksgiving with my parents. Here is my day-by-day account of NWP/NCTE 2009. Arriving in Philly on Tuesday afternoon, we had some time to enjoy a quick walk and prepare for the “Digital Is…” reception. Sponsored through NWP’s work with the MacArthur Foundation’s Digital Media and Learning Initiative, the entire “Digital Is…” conference was designed as an opportunity to convene teachers, teacher educators, and other stakeholders in conversations about what we know about teaching and learning with digital media. The opening reception was fun, followed by dinner with colleagues from Science Leadership Academy. A great way to begin our week, for sure. View more documents from devossda. 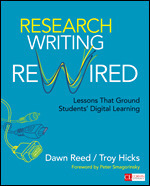 For the afternoon, I was again fortunate to present with Dawn about our work with podcasting, as featured in Teaching the New Writing. By doing a protocol analysis discussion of the work, we were really able to dig deeply and think about what was there. 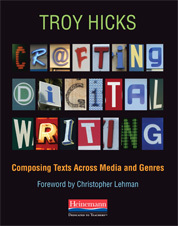 One of the more stunning realizations that we had in the conversation was about the ways in which the composing process changes when writers begin with the goal of creating a spoken and, in some sense, permanent text. I think that the line from the notes that captures it best is that the process of recording the podcast “reinforces writing as a capacity that changes across genres and audiences and mediums.” It will be interesting to see where Dawn goes next with this work. The second round of discussion was interesting, too, as we mixed up groups and have conversations across the elements of student work. Rather than try to capture all the complexities of that conversation in writing, I will share two items. The first is a list of “final words” that I asked participants in our session to state in relation to their thoughts about composing in digital environments at the end of this hour-long conversation. The second is a concept map that I tried to draw while we were talking. Neither alone captures all that happened in our session, but perhaps will give you some insights into what happened. I had the opportunity to then help close the day, asking participants to create “invitations” that could be used to ask other stakeholders to join in the conversation about digital writing with youth. 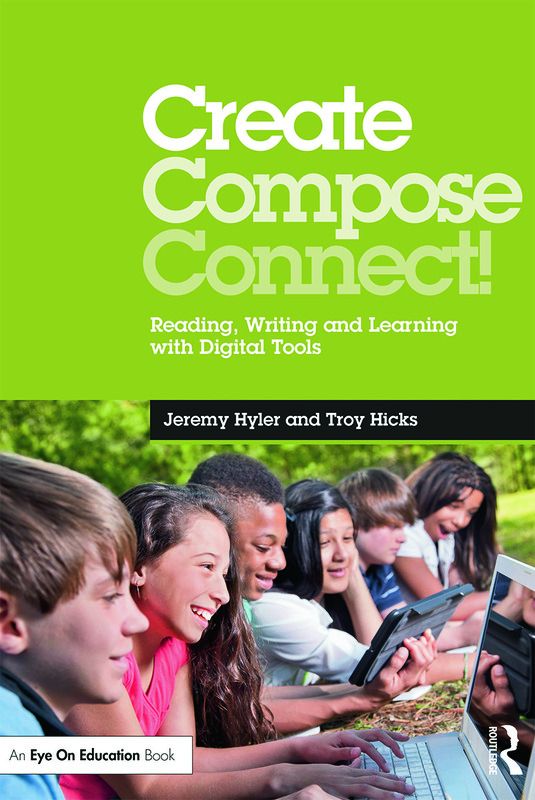 One of the most consistent themes from throughout the day was the fact that most of the digital writing opportunities that students have are taking place outside of school. This is a travesty. If we can create these types of engaging opportunities outside of school, then surely we can consider how to do better at creating these types of learning spaces inside of schools. This is something to chew on in the weeks and months to come as I figure out where to go next with my own work and the direction of our writing project. That night, we were treated to a panel discussion of “What Kids Learn When They Create with Digital Media” with Renee Hobbs, Founder, Media Education Lab, Temple University; Nichole Pinkard, Founder, Digital Youth Network and DePaul University professor; and Elyse Eidman-Aadahl, Director, National Programs and Site Development, National Writing Project. The NWP Annual Meeting kicked off with morning and afternoon workshops. In the morning, I attended one on developing site leadership and, in the afternoon, on integrating new literacies into the site’s work that featured Paige Cole, Joe Conroy, Shasta Looper, and Sara Beauchamp-Hicks. Along with Sara’s overview of how she integrated her own growth as a tech leader into her site’s work and securing mini-grants and creating professional development experiences, I was particularly interested in watching Paige and Joe talk about the work that they initially developed at Tech Matters 2007 and to see how they have grown work at their sites. Literally, I had goose bumps watching Paige’s video reflection. Taken with ideas from the morning about how to support and encourage site leaders, the two sessions reminded me of the power of the NWP network, and how small doses of encouragement from a mentor can turn into incredible work. More NWP today, with Billy Collins bringing down the house at the general session. Truly, truly wonderful. Also wonderful was the introduction of the Chippewa River Writing Project as one of the new sites in the NWP network! Later in the afternoon, I was able to attend a session on community partnerships, including a presentation from Joel Arquillos from the amazing 826 organization (which, if you haven’t heard about, watch Dave Eggers’ TED Talk and then visit the 826 website). Also, I got to hear about the Eastern Michigan Writing Project‘s Family Literacy workshops from their program director, Kim Pavlock. 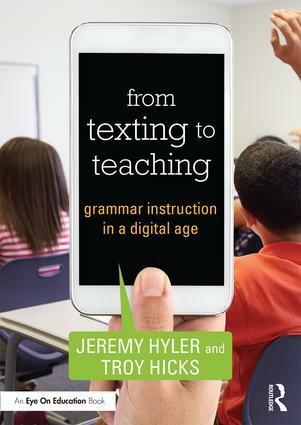 So many powerful ideas here from both Joel and Kim, but the biggest one being that we need to make learning to write purposeful for students and the process of doing so clear to their parents. What incredible programs to model from. To close the day, I got to hear from two of my mentors — Patti Stock and Peter Kittle — about the power of taking an inquiry stance towards teaching demonstrations in the summer institute. I am very much looking forward to returning to CRWP and talking over all this information with my leadership team, most of whom were there with me and will have ideas of their own to share, too. An early morning brought both Sara and me to the NCTE booth, leading Tech-to-Go sessions for those beginning their day at NCTE. I talked about wikis, while Sara presented on Google Forms and then, later in the day, on iPod Touch applications. This led us to my presentation with Bud Hunt, “Reports from Cyberspace,” This was truly an amazing session, as we tried to incorporate a backchannel discussion through Twitter, delicious, and Chatterous. Also, in trying to use newer tools for presentations, I created a Prezi and Bud made a Voice Thread. The conversations that occured in the session, both face-to-face and online, were amazing, and we are thinking about repeating the session again next year. 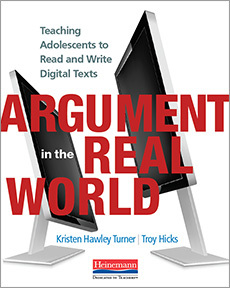 One recurring question was about access, and both Bud and I contended that it is reasonable to expect kids to do digital writing now, because there is access available in many more places and most of the tools are web-based. 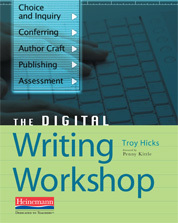 We also touched on issues of filtering, curriculum, assessment, and how to begin digital writing workshops. We awoke Sunday morning for a wonderful session on erasing copyright confusion, and I was then able to interview Renee Hobbs for an aricle on fair use for CCCC-IP. We also were able to meet with the CEE Web Site Editors, and came up with a plan for developing some basic content for the site. Our afternoon found us on adventures in Philly with my friend Carl Young, and we enjoyed a visit to the National Constitution Center. In thinking about how and why we ask students to compose digital writing, our visit to this center was particularly appropriate, as we were greeted with remixed versions of “People” magazine covers, featuring such historical figures as Abraham Lincoln and Betsy Ross, as well as a highly-interactive multimedia experince in the museum. While we had planned to go to SLA, and appreciated the invite to be there, we ended up spending most of our day at at the Franklin Institute. Perhaps we will have to do EduCon instead. So, even though we missed SLA, we greatly enjoyed the Body Worlds exhibition, and felt that was a good use of our final hours in Philly. Also, we realized that we missed the NCTE Centennial Preview, but John Golden provided the link for me, so you can enjoy it online! As with all NWP/NCTE trips, this one game me so many good ideas and connections with colleagues. Next on my agenda are to begin planning next summer’s CRWP SI and, ideally, an advanced institute related to digital writing and copyright. Also, I am working on writing the article for the Cs Intellectual Property Caucus, CCCC-IP. Still thinking about so much, and hoping to get back to Philly with my entire family for more of the historical aspects of the town that we missed. And, so goes another NWP Annual Meeting and NCTE Convention. Thanks for sticking with me through this whole pose. Now, time to plan for the convention in Orlando, celebrating 100 years of NCTE.